FMW 12.2.1.1 is released !!! FMW 12.2.1.1 was released last week and it seems to be a patch release for 12.2.1. 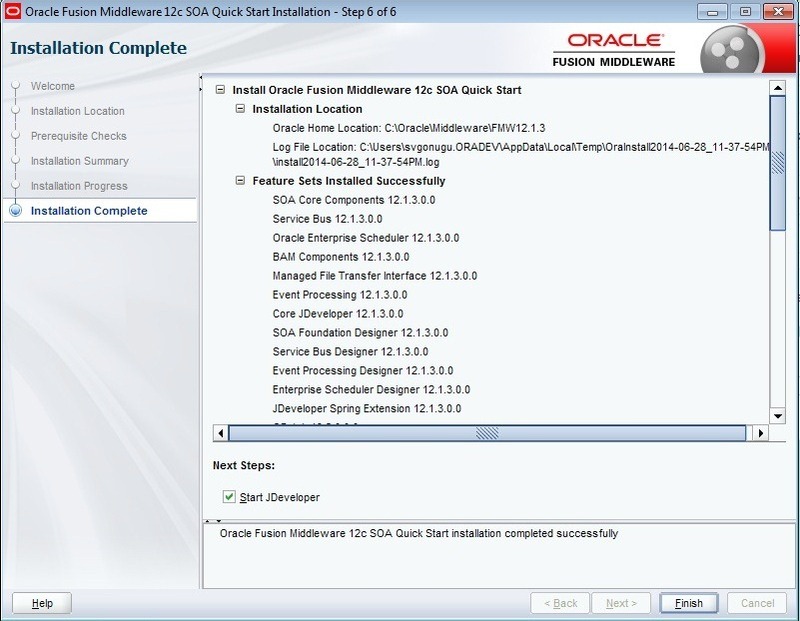 Some quick links related to SOA are given below. 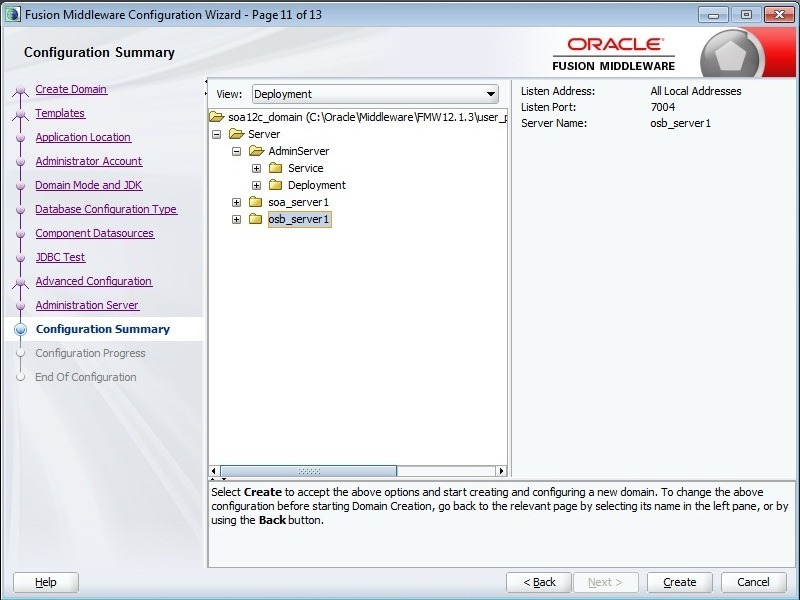 When JDeveloper 12.1.3 is installed, the Sales force adapter is shown and available by default but the other cloud adapters like Sales Cloud, Right Now, HCM Cloud etc.. will not be available. 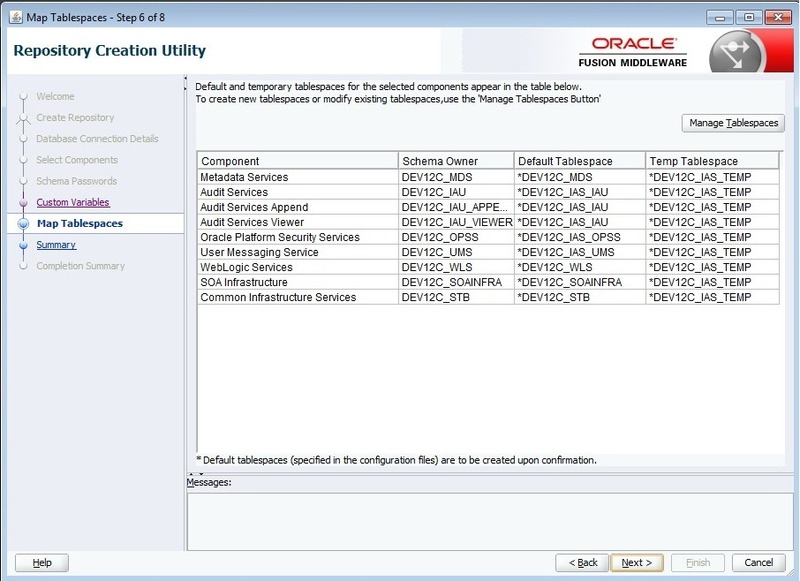 In this post, I will show how to install these adapters through patches provided by Oracle. 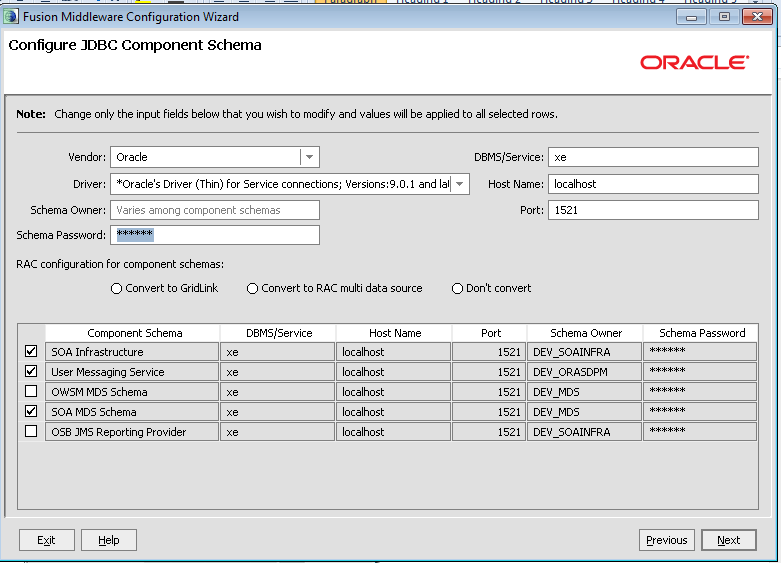 These integration adapters can be downloaded from here and available on top of 12.1.3.0.1 (BP1). 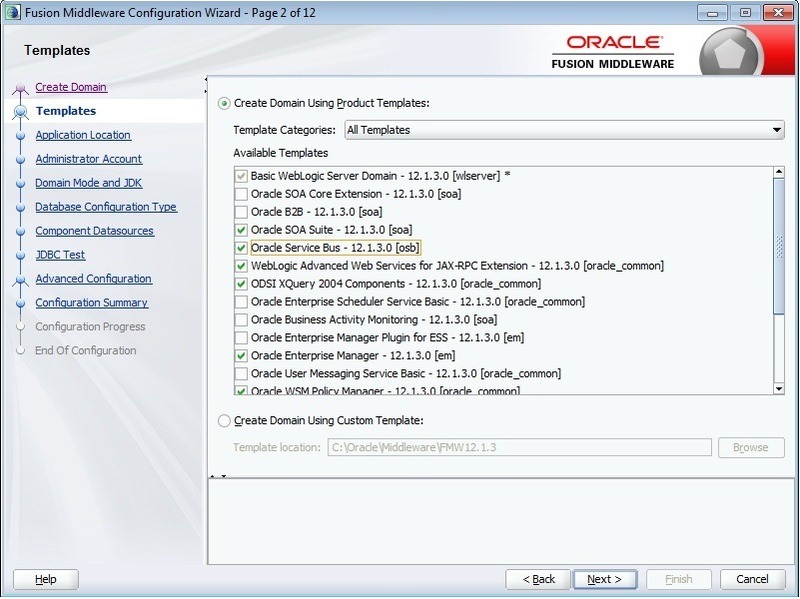 Do download Oracle Cloud Adapters 12.1.3.0.1. 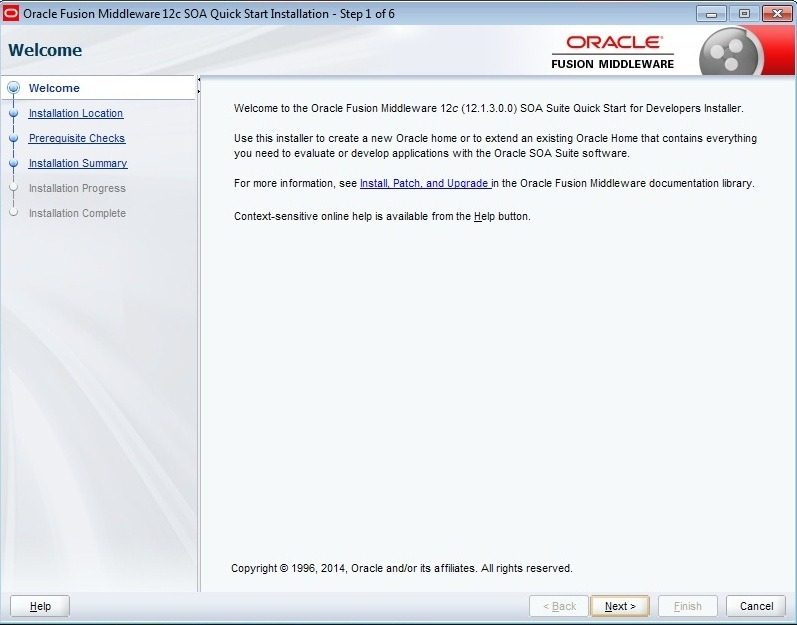 Install Oracle SOA 12.1.3 using quick installer. Apply p19707784 using OPatch to bring it to BP1. Refer to this post for additional help on OPatch utility. Unzip the above download and observe the following patches available. Apply p20680367* and p20780464* in same middleware home. 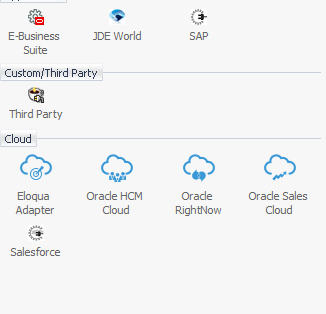 Create JDeveloper shortcut from below location and open to observe the cloud adapters Eloqua Adapter, Oracle HCM Cloud, Oracle RightNow and Oracle Sales Cloud available in Cloud section. 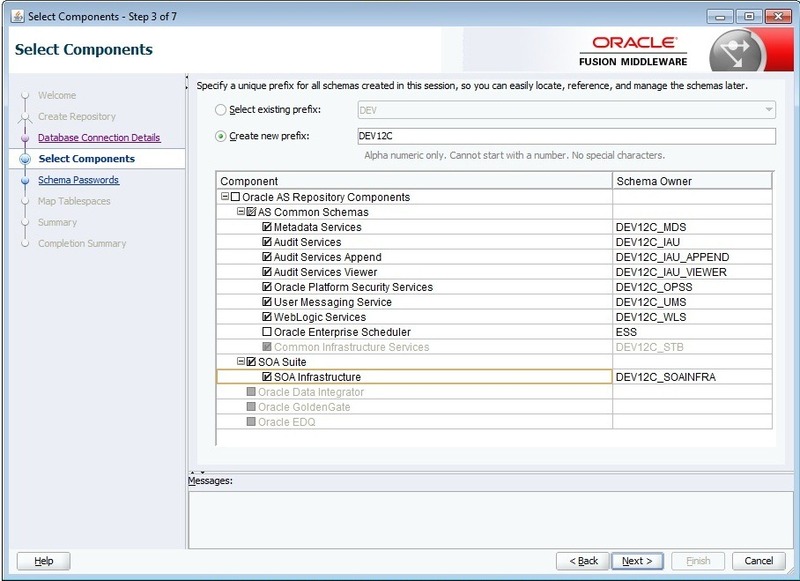 You will get to see this section when you create new SOA or Service Bus Application. If you are not seeing these adapters, add –clean** option as shown below in your desktop shortcut and re-open JDeveloper. * Always read the patch README files and follow the available instructions. ** I thank my colleague who helped me by providing this workaround. 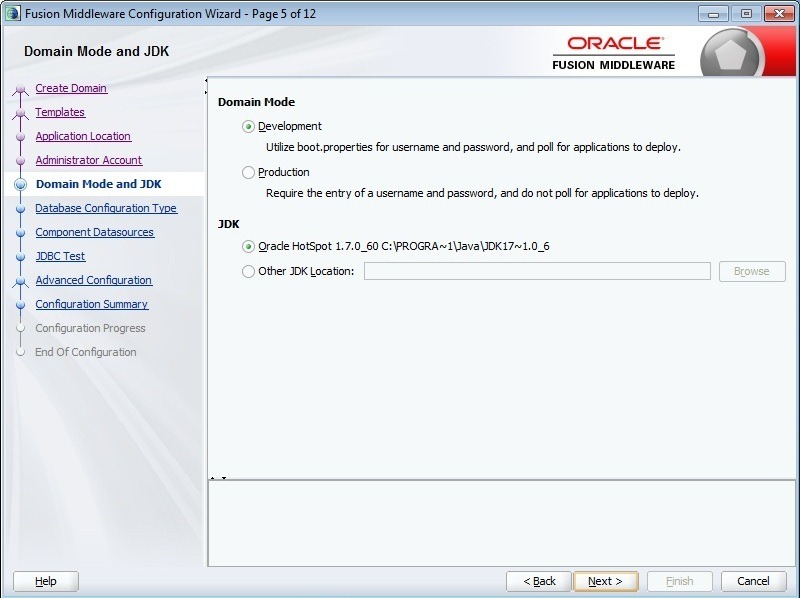 By this time, you might already know that SOA Suite12c released last week. The twitter world is abuzz with the most awaited SOA Suite release and gave a welcome in great fashion. I too was equally excited to get a glimpse of it and try out some hands-on the same. 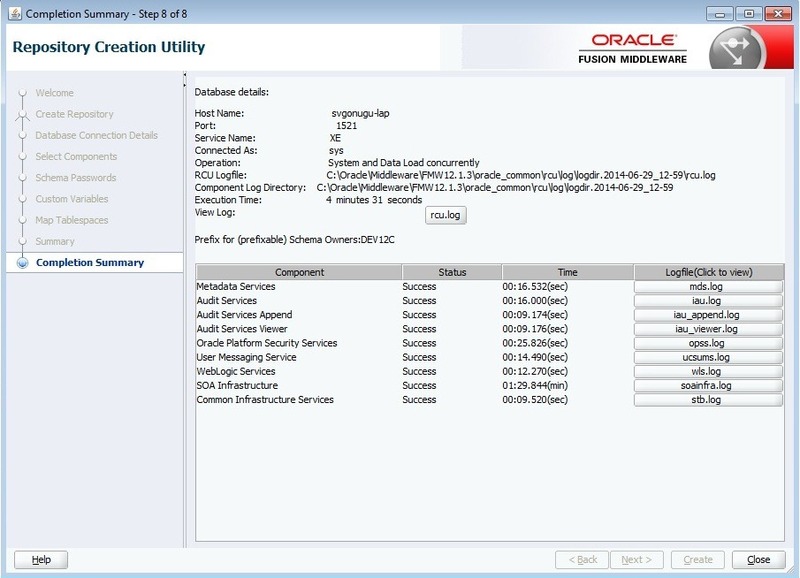 In this post, we will quickly go through the SOA Suite 12c installation. We can say that installation is quite streamlined and made simple with single installer that includes JDeveloper, JDev SOA Extension, RCU, Standalone WLS and Service Bus (formerly Oracle Service Bus). The installer can be downloaded from here. I tried this installation in Windows 7, 64-bit machine. 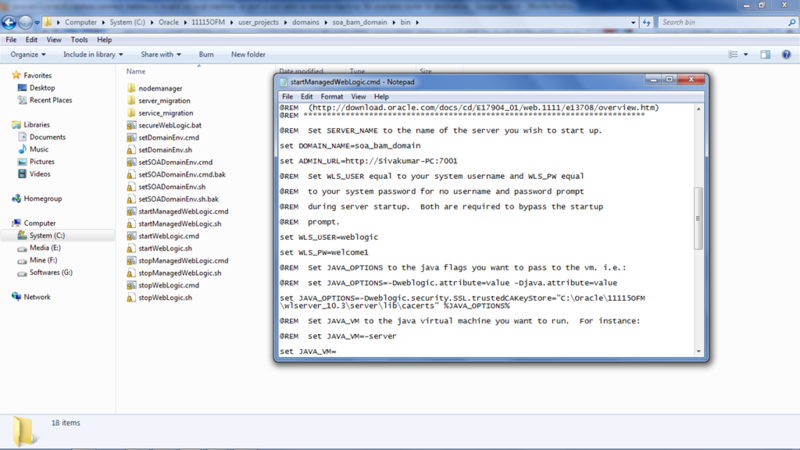 Make sure you installed JDK and JAVA_HOME environment variable is set before proceeding with the installation. Unzip the installer and start the installation as shown below. This brings up the welcome screen. 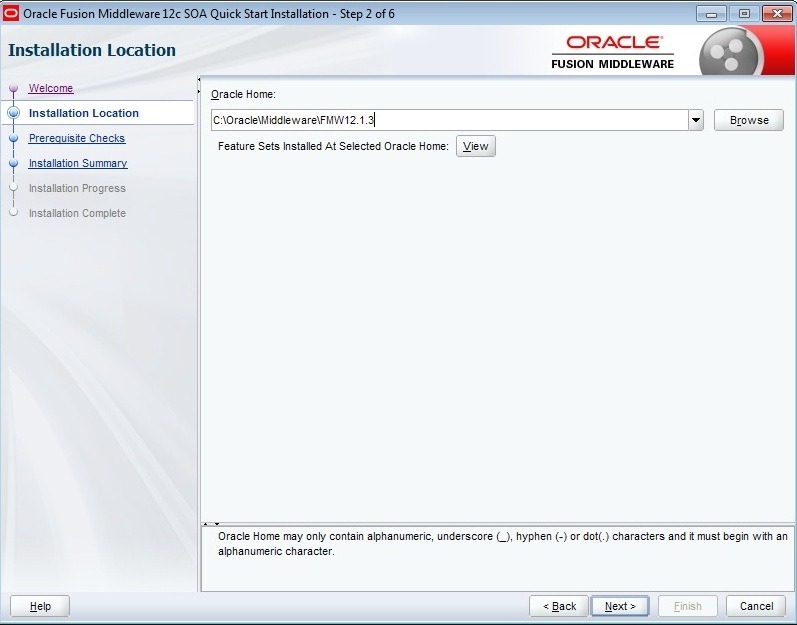 Click Next and set Oracle Home to your desired location. Click Next to finish Prerequisites check. Click Next. 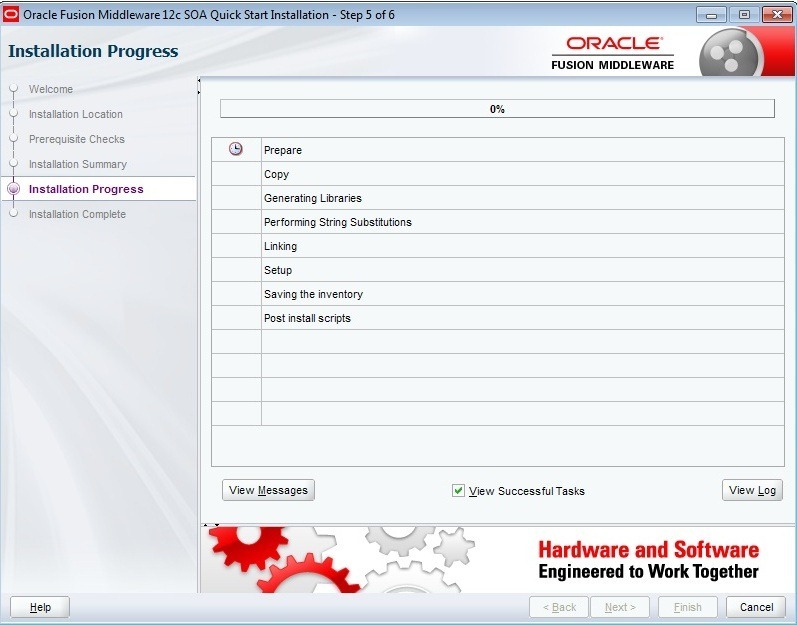 Here you can review the installation summary and click Install. 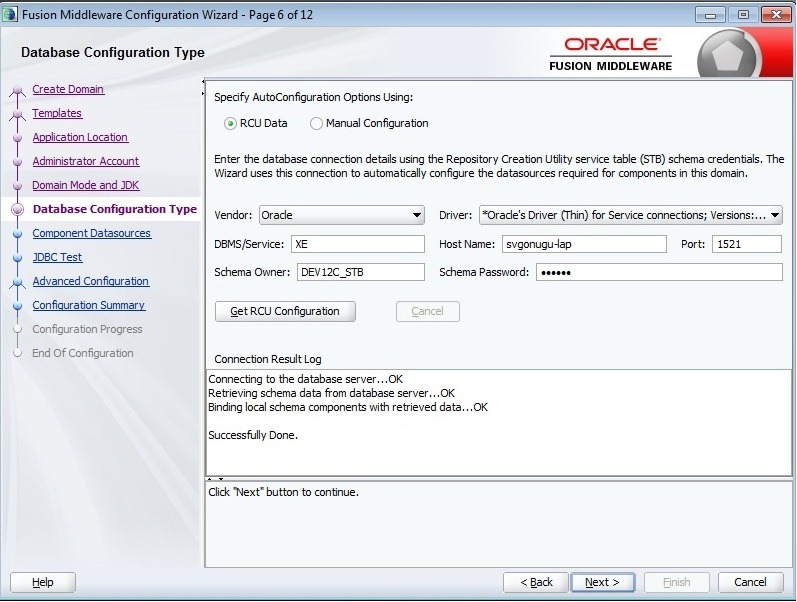 You need to create the required schemas using RCU before proceeding with domain creation. As I mentioned earlier, no separate installer is required for RCU and comes by default with SOA Suite. Navigate to $MW_HOME/oracle_common/bin. Locate file rcu.bat and select ‘Run as Administrator’ on right click to bring up the following welcome screen. 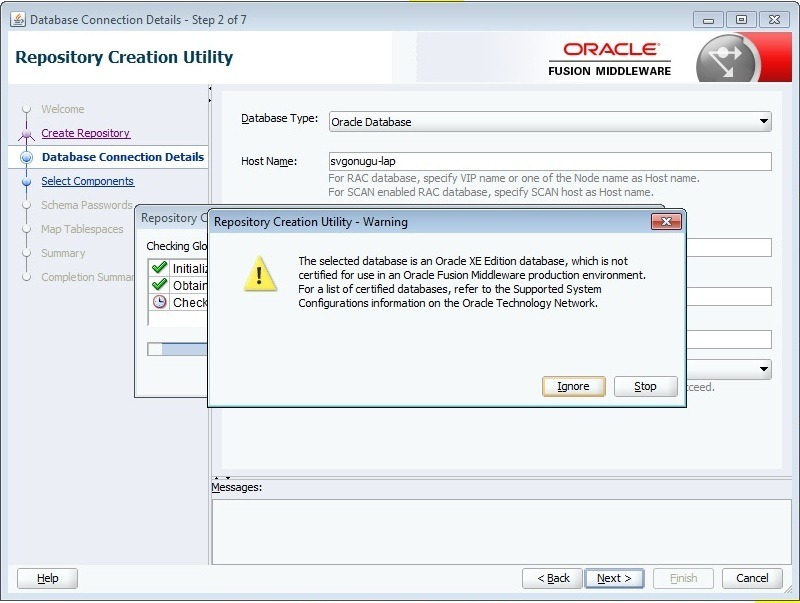 Make sure that you installed a supported database before proceeding. Click Next and choose default options for creating the repository. 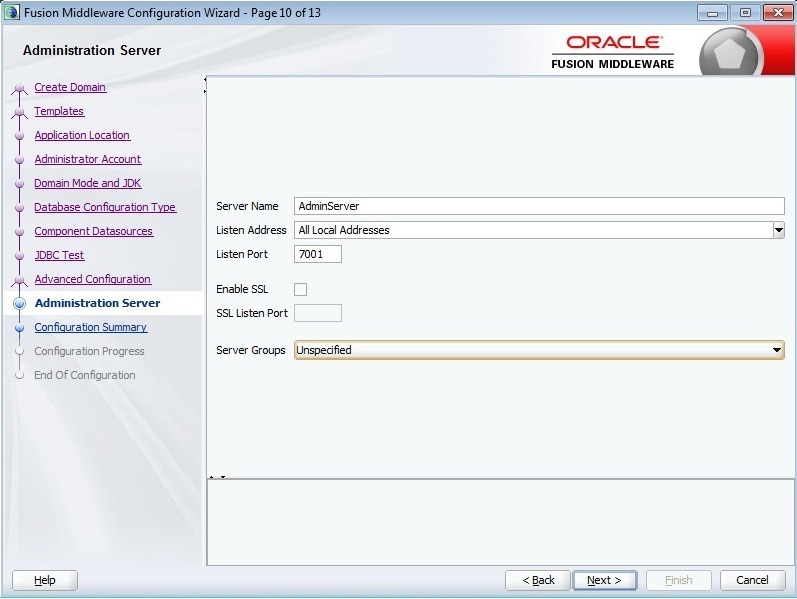 Click Next and enter your database information with sys credentials. 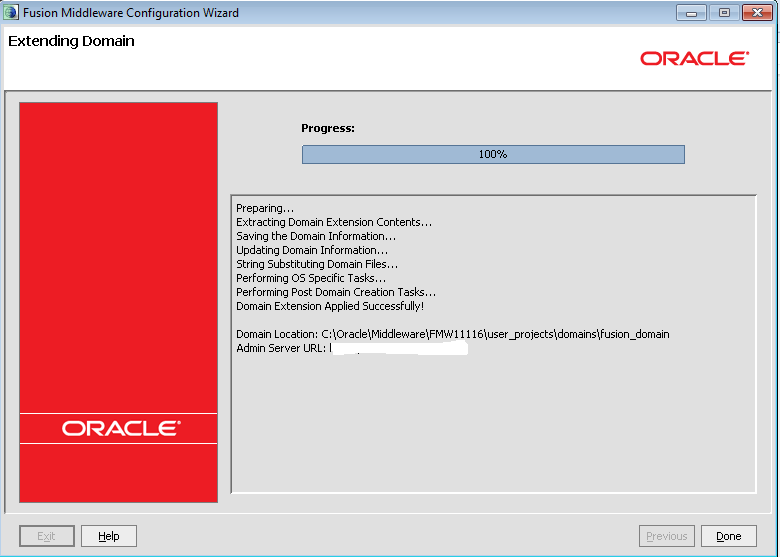 Click on Next and you can Ignore the warning related to Oracle XE database as you are going to use this domain for development purpose. RCU will perform some prerequisite checks. Click OK to bring up following screen. 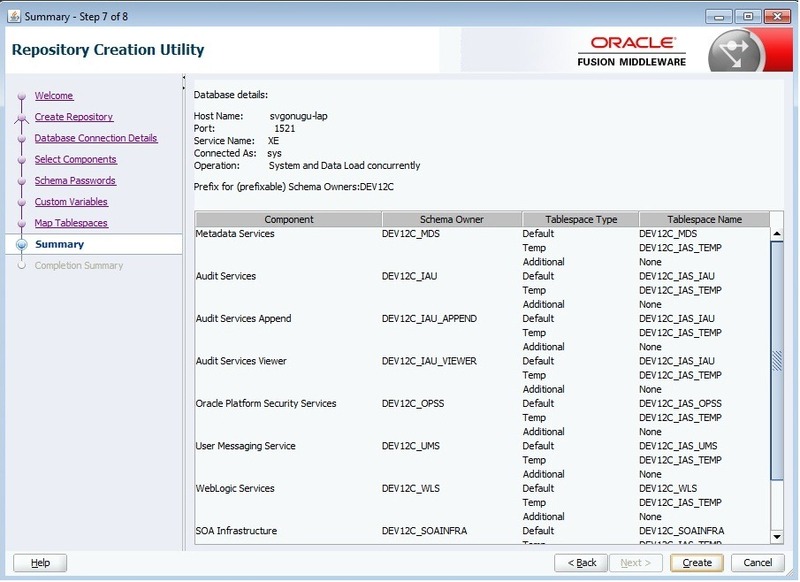 Enter prefix as you desired and select SOA Infrastructure schema. This will automatically select all other dependent schemas as shown. Click Next and enter the password for all schemas. Click Next and proceed to next screen by accepting the defaults. Click on Close to finish RCU installation. Navigate to $MW_HOME/oracle_common/common/bin and locate the file config.cmd. 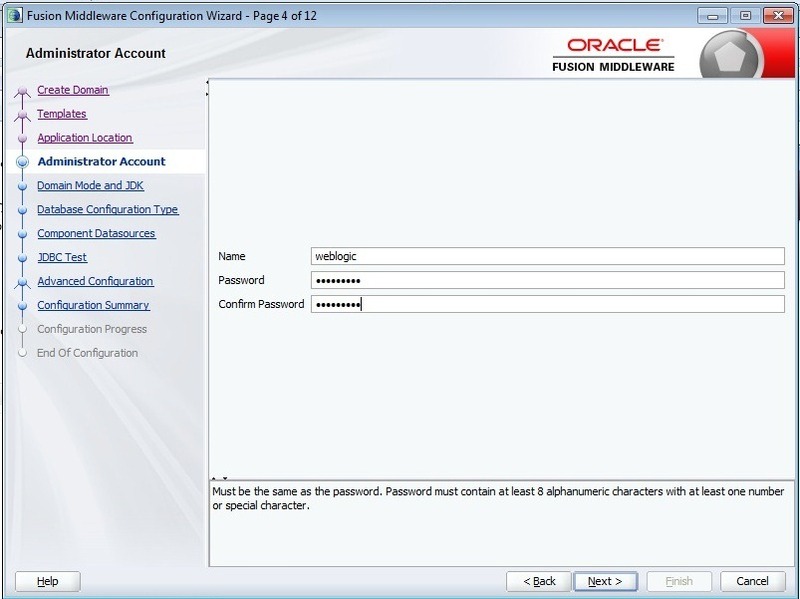 Right click and select ‘Run as Administrator’ to bring up the following screen. Enter your desired domain name. Click Next and select the products that your domain want to support. Click Next and proceed further by accepting the defaults. Click Next and enter the credentials. Click Next and choose Domain Mode. You may want to retain Development as Domain Mode. You can accept defaults for JDK or you can select any other location. Click Next. 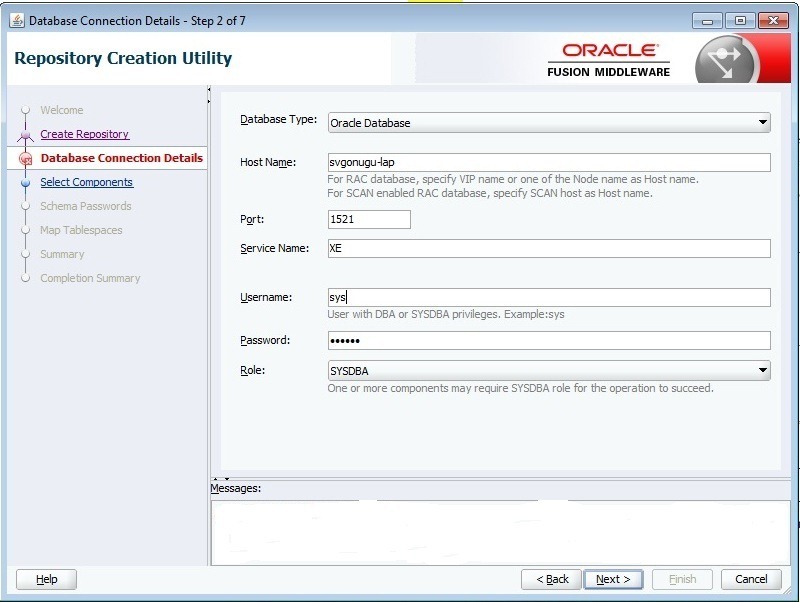 Enter STB schema information as shown below and click Get RCU Configuration. Once schema retrieving is successfully done, click Next. Click Next and verify that connection test is successful for all the schemas. If not, you can go back to previous screen and modify individual schema connection information. Once testing is done, Click Next and accept the defaults. 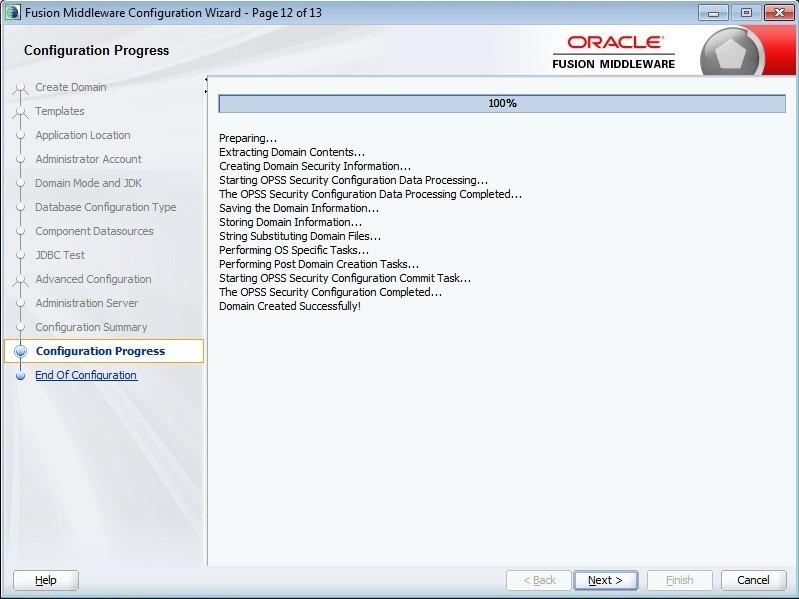 Click Next and in this screen you verify the domain configuration the wizard is going to create. 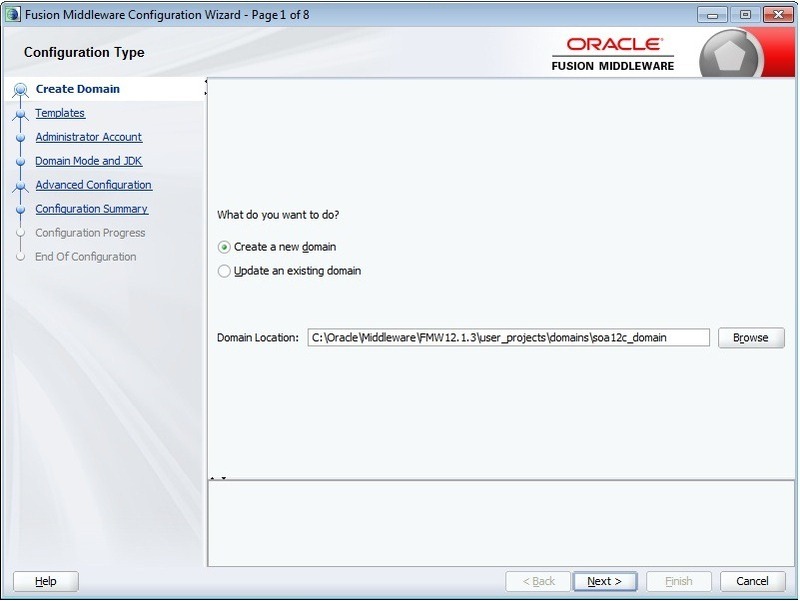 Click Create to start the domain creation. Once the the domain creation is successful, Click Next. 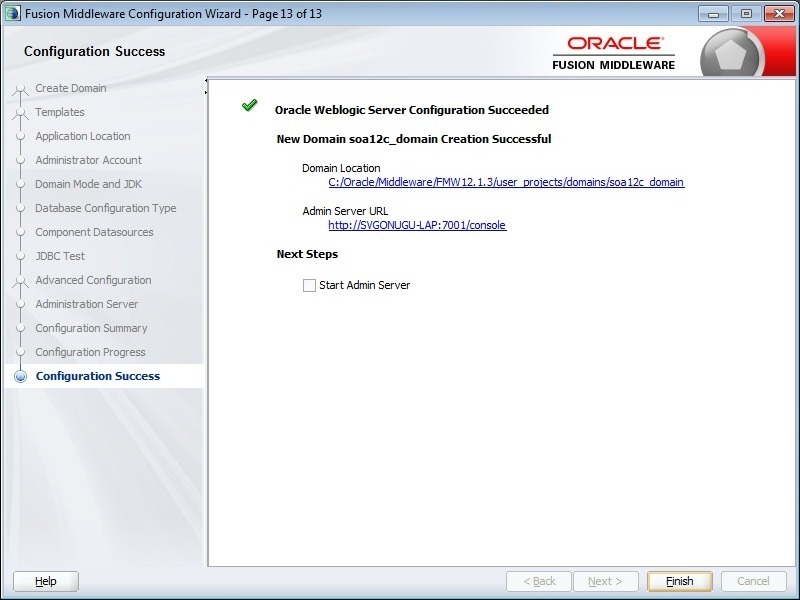 Remember Domain Location and Admin Server URL and click Finish to exit the configuration wizard. Start the Admin and Managed Servers by executing startWebLogic.cmd, startManagedWeblogic.cmd respectively from bin folder of Domain Location (shown above). 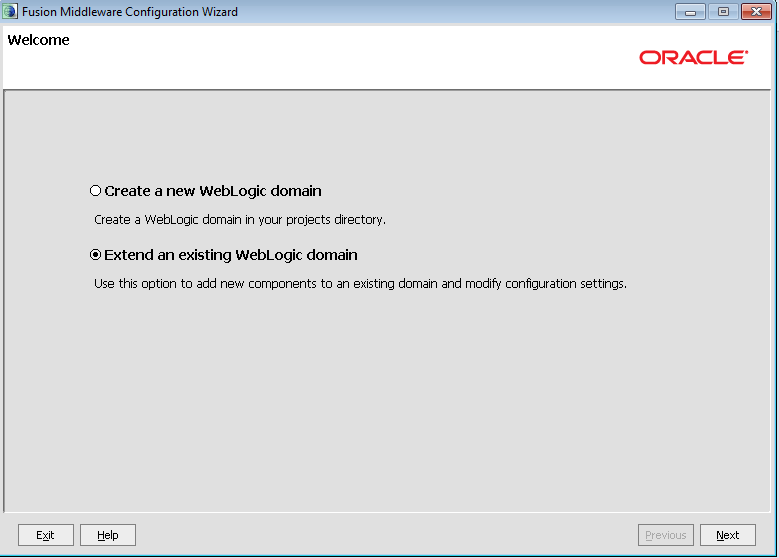 In this post, I quickly show you how to extend an existing weblogic domain which is quite simple and straight forward. 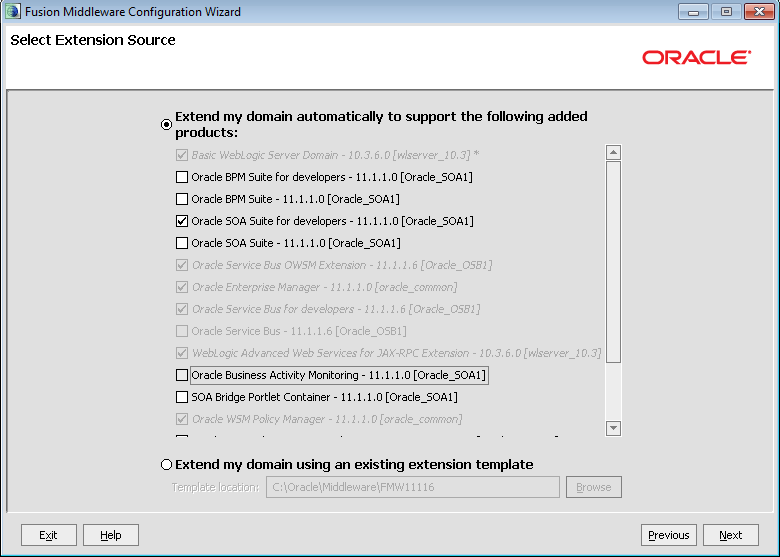 Initially i have OSB domain and extended the same domain to include SOA. Open the configuration wizard (config.cmd) from $MW_HOME/wlserver_10.3\common\bin and select the option as shown below and click on Next. 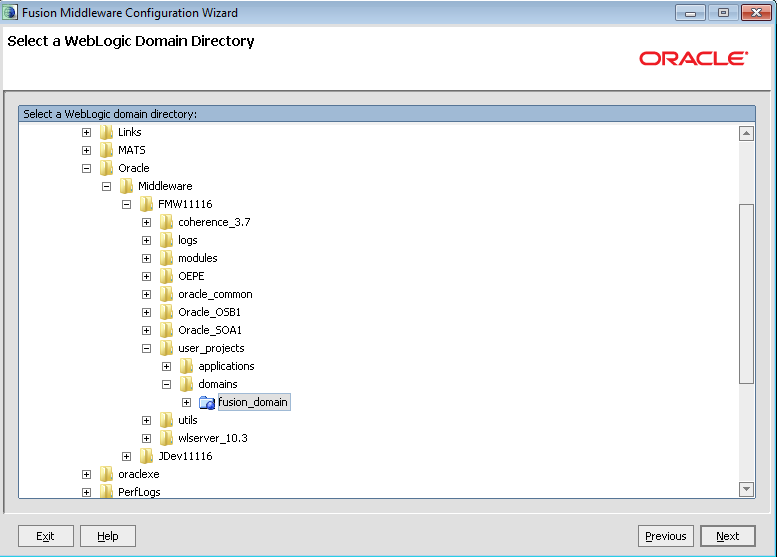 Select the domain directory from the selection browser. Choose the products from the displayed list. 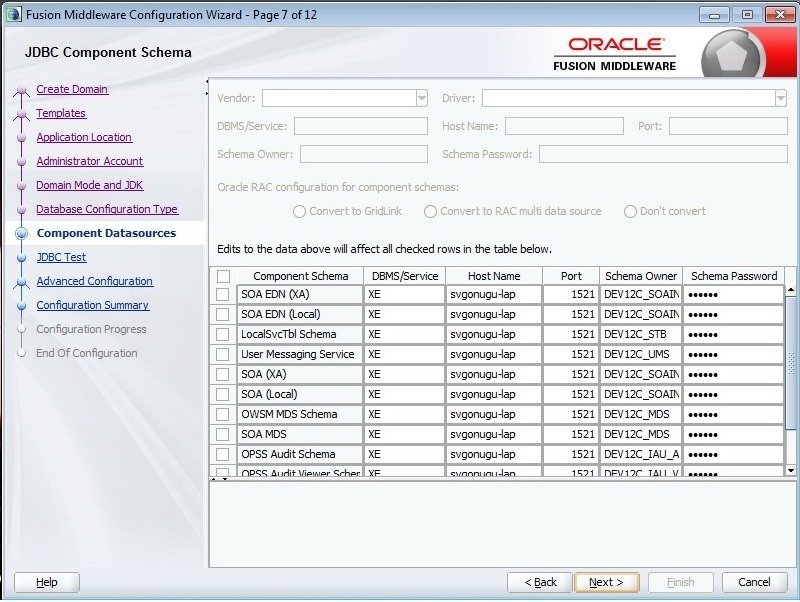 Give database schema details for new components that get added because of the selection in the previous screen. 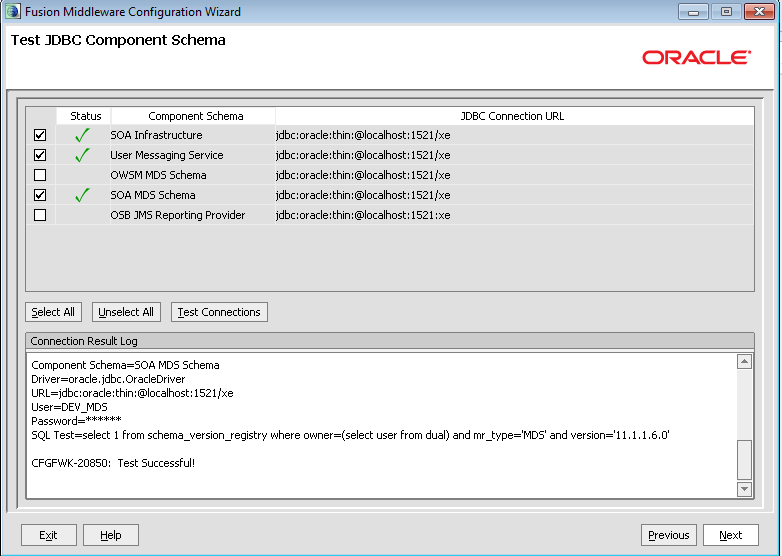 For example, in the current scenario the component schemas ‘SOA Infrastructure’ , ‘User Messaging Service’ and ‘SOA MDS Schema’ have to modified with correct database information as shown below and click on Next. Make sure that connection is successful by observing the logs shown and click on Next twice. 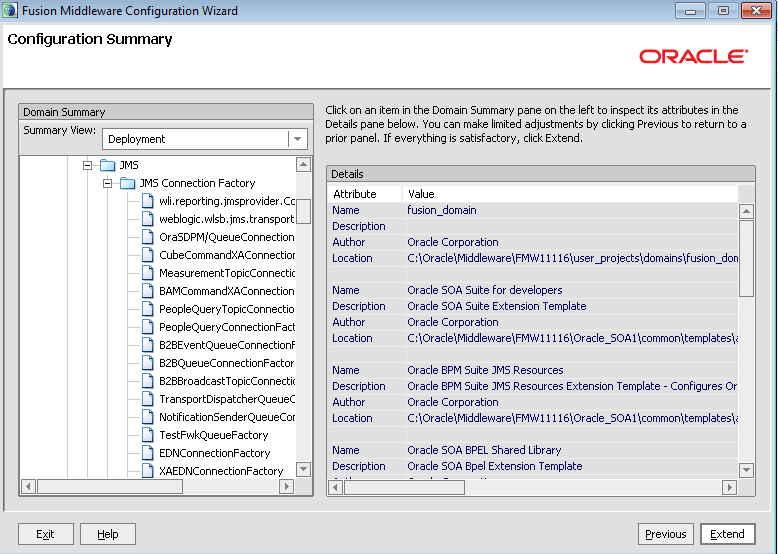 Verify the configuration summary and click on Extend button to finish. Once the domain is created, click on Done button and bring up the server to verify the installation of SOA server by opening the EM console and look for soa_infra. Getting the following error while starting the managed server. The admin server has been started successfully without any issues. 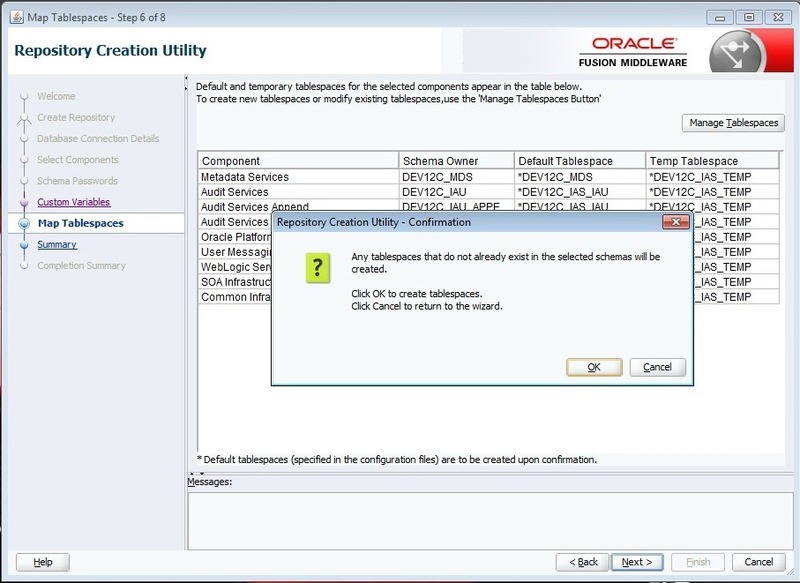 I have installed SOA Suite and OSB several times but never observed an issue with soa-infra. 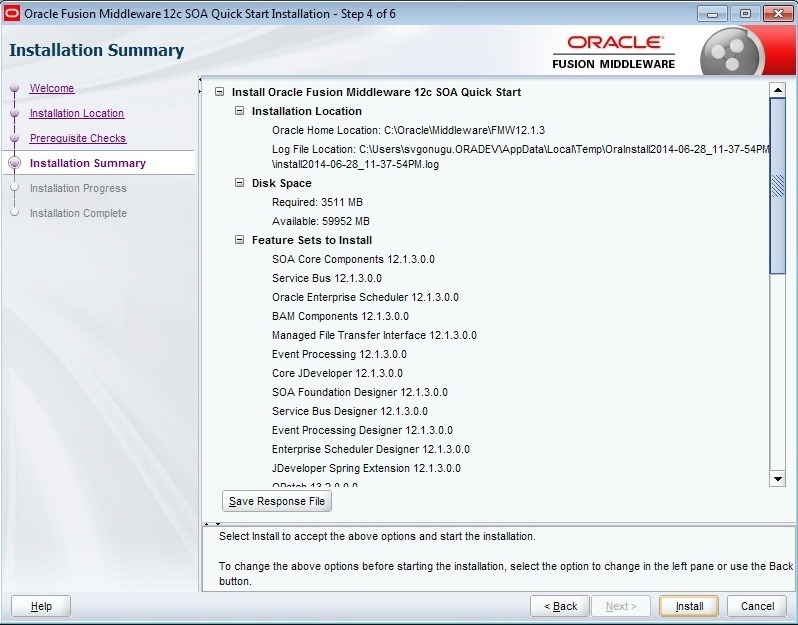 I used Oracle DB Enterprise Edition in all these installations. 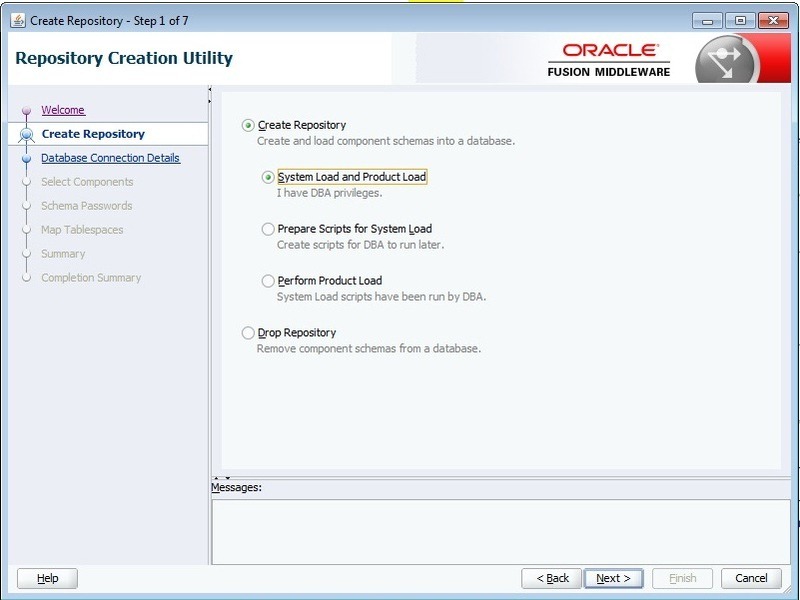 Do ‘grant execute on dbms_lob to public’ in sqlplus using sys login. 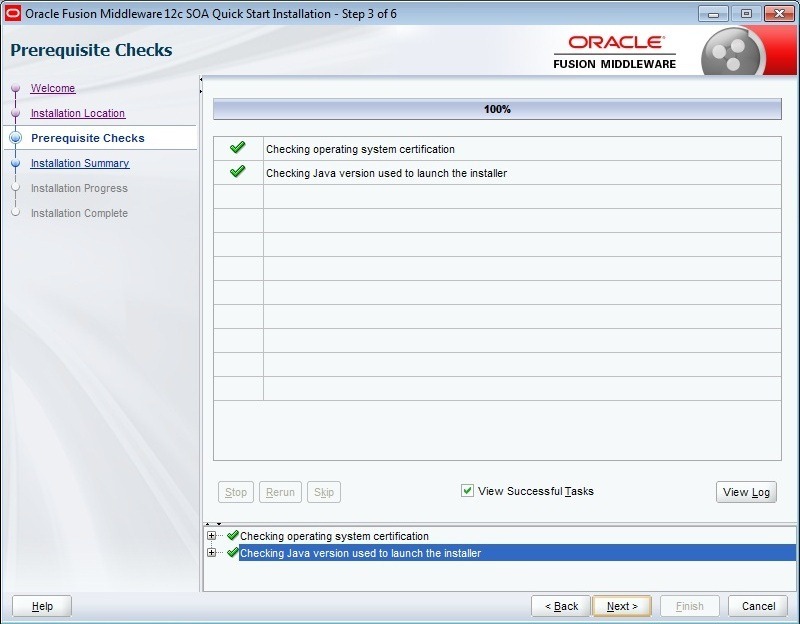 Restart the server and verify that soa-infra is in Active status now. 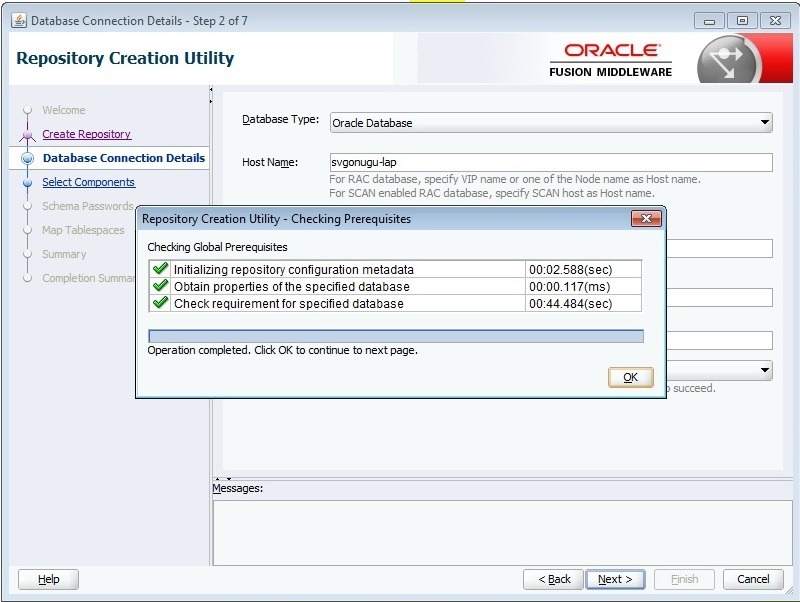 If the issue is not resolved drop the schema and recreate using the RCU. 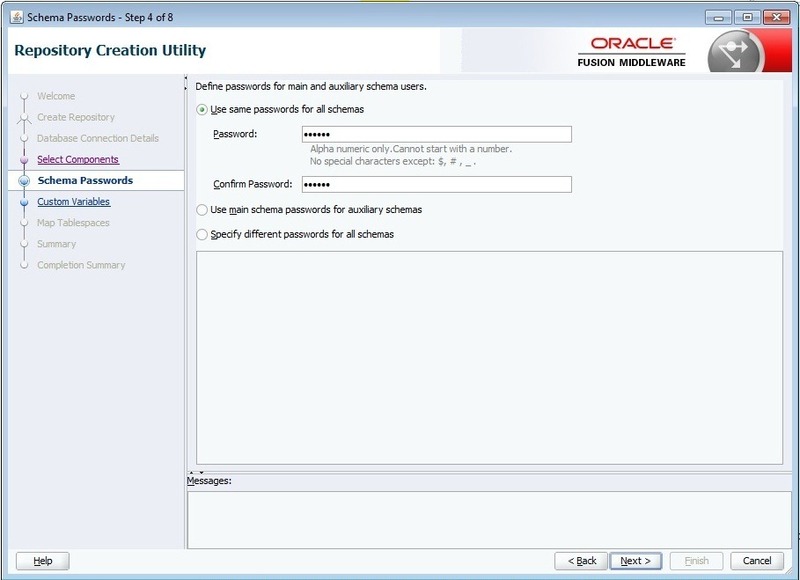 But before recreating, make sure that following environment variable is set when using XE database. Ever since i have seen this post by Antony Reynolds, i wanted to grab my copy of this book. But the price of the book in India kept me away for some time. Finally last week i am able to get my copy of it. The first sight of the book perplexed me as i was expecting the book to be of size similar to Thomas Erls’ book ‘Web Service Contract Design & Versioning for SOA’. But the contents of the book made me realize that the size does not matter always. The book is well organized into 3 parts. 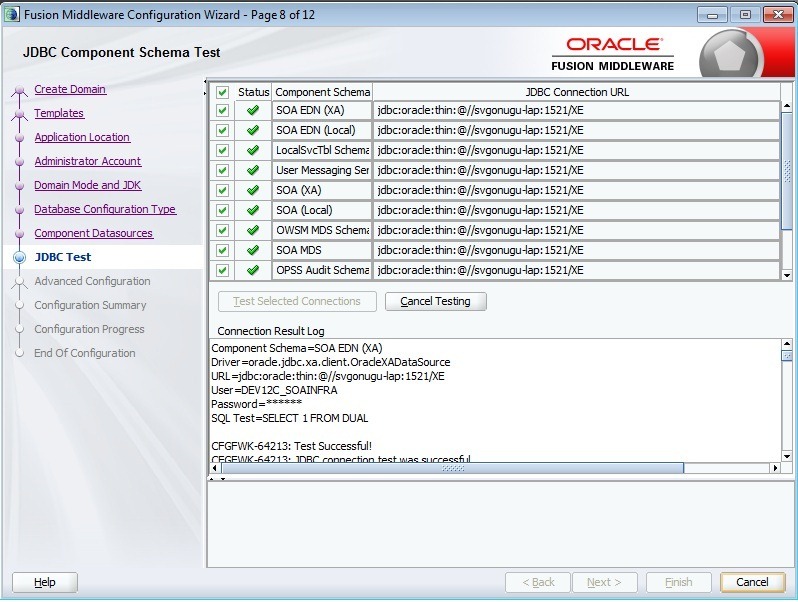 Part-I introduces the SOA architecture SCA, developing BPEL composites, endpoint virtualization using OSB and using JCA Adapters, Human workflows, Business Rules, Business Events and Business Activity Monitoring (BAM) that are components of Oracle SOA Suite. Part-II introduces the business requirements of a fictitious company and proceed with the development of application using SOA architecture by making use of the components described in Part-I. Finally the book ends with chapters on deployment, testing and security which constitutes Part-III of the book. The above things are covered in Chapter 16 and Chapter 14 respectively. I am reading the chapters in no sequence and i found the chapters Designing Service Contract (Chapter 11), Error Handling (Chapter 14) and Message Interaction Patterns (Chapter 16) very interesting as of now. Though my recommendation does not add any brownie points, i recommend this book to novice to learn the basics of SOA Suite11g and to experts to get the quick summary. I want to finish it off asap before somebody steals the book .